Because, five weeks later, there was a heat-wave in the Red Sea, and everybody took off all the clothes they had. The Parsee took off his hat; but the Rhinoceros took off his skin and carried it over his shoulder as he came down to the beach to bathe. In those days it buttoned underneath with three buttons and looked like a waterproof. He said nothing whatever about the Parsee’s cake, because he had eaten it all; and he never had any manners, then, since, or henceforward. He waddled straight into the water and blew bubbles through his nose, leaving his skin on the beach. And the Rhinoceros did. He buttoned it up with the three buttons, and it tickled like cake-crumbs in bed. Then he wanted to scratch, but that made it worse; and then he lay down on the sands and rolled and rolled and rolled, and every time he rolled the cake-crumbs tickled him worse and worse and worse. Then he ran to the palm-tree and rubbed and rubbed and rubbed himself against it. He rubbed so much and so hard that he rubbed his skin into a great fold over his shoulders, and another fold underneath, where the buttons used to be (but he rubbed the buttons off), and he rubbed some more folds over his legs. And it spoiled his temper, but it didn’t make the least difference to the cake-crumbs. They were inside his skin and they tickled. So he went home, very angry indeed and horribly scratchy; and from that day to this every rhinoceros has great folds in his skin and a very bad temper, all on account of the cake-crumbs inside. IN the days when everybody started fair, Best Beloved, the Leopard lived in a place called the High Veldt. ‘Member it wasn’t the Low Veldt, or the Bush Veldt, or the Sour Veldt, but the ‘sclusively bare, hot, shiny High Veldt, where there was sand and sandy-coloured rock and ‘sclusively tufts of sandy-yellowish grass. The Giraffe and the Zebra and the Eland and the Koodoo and the Hartebeest lived there; and they were ‘sclusively sandy-yellow-brownish all over; but the Leopard, he was the ‘sclusivest sandiest-yellowish-brownest of them all—a greyish-yellowish catty-shaped kind of beast, and he matched the ‘sclusively yellowish-greyish-brownish colour of the High Veldt to one hair. This was very bad for the Giraffe and the Zebra and the rest of them; for he would lie down by a ‘sclusively yellowish-greyish-brownish stone or clump of grass, and when the Giraffe or the Zebra or the Eland or the Koodoo or the Bush-Buck or the Bonte-Buck came by he would surprise them out of their jumpsome lives. He would indeed! And, also, there was an Ethiopian with bows and arrows (a ‘sclusively greyish-brownish-yellowish man he was then), who lived on the High Veldt with the Leopard; and the two used to hunt together—the Ethiopian with his bows and arrows, and the Leopard ‘sclusively with his teeth and claws—till the Giraffe and the Eland and the Koodoo and the Quagga and all the rest of them didn’t know which way to jump, Best Beloved. They didn’t indeed! But they didn’t. The Leopard and the Ethiopian hunted all day; and though they could smell them and hear them, they never saw one of them. Oh, now and then you will hear grown-ups say, ‘Can the Ethiopian change his skin or the Leopard his spots?’ I don’t think even grown-ups would keep on saying such a silly thing if the Leopard and the Ethiopian hadn’t done it once—do you? But they will never do it again, Best Beloved. They are quite contented as they are. People have come—in a carriage—calling. But Mummy is there. . . . Yes, I can go if you take me—Nurse says she don’t care. Let’s go up to the pig-sties and sit on the farmyard rails! Let’s say things to the bunnies, and watch ‘em skitter their tails! And here’s your pipe and tobacco. Oh, come along out of it—quick. IN the High and Far-Off Times the Elephant, O Best Beloved, had no trunk. He had only a blackish, bulgy nose, as big as a boot, that he could wriggle about from side to side; but he couldn’t pick up things with it. But there was one Elephant—a new Elephant—an Elephant’s Child—who was full of ‘satiable curtiosity, and that means he asked ever so many questions. And he lived in Africa, and he filled all Africa with his ‘satiable curtiosities. He asked his tall aunt, the Ostrich, why her tail-feathers grew just so, and his tall aunt the Ostrich spanked him with her hard, hard claw. He asked his tall uncle, the Giraffe, what made his skin spotty, and his tall uncle, the Giraffe, spanked him with his hard, hard hoof. And still he was full of ‘satiable curtiosity! He asked his broad aunt, the Hippopotamus, why her eyes were red, and his broad aunt, the Hippopotamus, spanked him with her broad, broad hoof; and he asked his hairy uncle, the Baboon, why melons tasted just so, and his hairy uncle, the Baboon, spanked him with his hairy, hairy paw. And still he was full of ‘satiable curtiosity! He asked questions about everything that he saw, or heard, or felt, or smelt, or touched, and all his uncles and his aunts spanked him. And still he was full of ‘satiable curtiosity! One fine morning in the middle of the Precession of the Equinoxes this ‘satiable Elephant’s Child asked a new fine question that he had never asked before. He asked, ‘What does the Crocodile have for dinner?’ Then everybody said, ‘Hush!’ in a loud and dretful tone, and they spanked him immediately and directly, without stopping, for a long time. That very next morning, when there was nothing left of the Equinoxes, because the Precession had preceded according to precedent, this ‘satiable Elephant’s Child took a hundred pounds of bananas (the little short red kind), and a hundred pounds of sugar-cane (the long purple kind), and seventeen melons (the greeny-crackly kind), and said to all his dear families, ‘Good-bye. I am going to the great grey-green, greasy Limpopo River, all set about with fever-trees, to find out what the Crocodile has for dinner.’ And they all spanked him once more for luck, though he asked them most politely to stop. Then the Bi-Coloured-Python-Rock-Snake uncoiled himself very quickly from the rock, and spanked the Elephant’s Child with his scalesome, flailsome tail. Then the Crocodile winked the other eye, and lifted half his tail out of the mud; and the Elephant’s Child stepped back most politely, because he did not wish to be spanked again. ‘Come hither, Little One,’ said the Crocodile, ‘for I am the Crocodile,’ and he wept crocodile-tears to show it was quite true. Then the Elephant’s Child put his head down close to the Crocodile’s musky, tusky mouth, and the Crocodile caught him by his little nose, which up to that very week, day, hour, and minute, had been no bigger than a boot, though much more useful. Then the Elephant’s Child sat back on his little haunches, and pulled, and pulled, and pulled, and his nose began to stretch. And the Crocodile floundered into the water, making it all creamy with great sweeps of his tail, and he pulled, and pulled, and pulled. And the Elephant’s Child’s nose kept on stretching; and the Elephant’s Child spread all his little four legs and pulled, and pulled, and pulled, and his nose kept on stretching; and the Crocodile threshed his tail like an oar, and he pulled, and pulled, and pulled, and at each pull the Elephant’s Child’s nose grew longer and longer—and it hurt him hijjus! 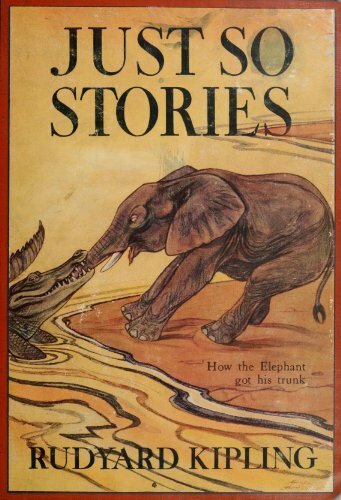 Before he thought what he was doing the Elephant’s Child put out his trunk and plucked a large bundle of grass, dusted it clean against his fore-legs, and stuffed it into his own mouth. ‘It is,’ said the Elephant’s Child, and before he thought what he was doing he schlooped up a schloop of mud from the banks of the great grey-green, greasy Limpopo, and slapped it on his head, where it made a cool schloopy-sloshy mud-cap all trickly behind his ears. ‘How would you like to spank somebody?’ said the Bi-Coloured-Python-Rock-Snake. ‘I should like it very much indeed,’ said the Elephant’s Child. So the Elephant’s Child went home across Africa frisking and whisking his trunk. When he wanted fruit to eat he pulled fruit down from a tree, instead of waiting for it to fall as he used to do. When he wanted grass he plucked grass up from the ground, instead of going on his knees as he used to do. When the flies bit him he broke off the branch of a tree and used it as a fly-whisk; and he made himself a new, cool, slushy-squshy mud-cap whenever the sun was hot. When he felt lonely walking through Africa he sang to himself down his trunk, and the noise was louder than several brass bands. He went especially out of his way to find a broad Hippopotamus (she was no relation of his), and he spanked her very hard, to make sure that the Bi-Coloured-Python-Rock-Snake had spoken the truth about his new trunk. The rest of the time he picked up the melon rinds that he had dropped on his way to the Limpopo—for he was a Tidy Pachyderm. Then he uncurled his trunk and knocked two of his dear brothers head over heels. ‘It looks very ugly,’ said his hairy uncle, the Baboon. ‘It does,’ said the Elephant’s Child. ‘But it’s very useful,’ and he picked up his hairy uncle, the Baboon, by one hairy leg, and hove him into a hornet’s nest. Then that bad Elephant’s Child spanked all his dear families for a long time, till they were very warm and greatly astonished. He pulled out his tall Ostrich aunt’s tail-feathers; and he caught his tall uncle, the Giraffe, by the hind-leg, and dragged him through a thorn-bush; and he shouted at his broad aunt, the Hippopotamus, and blew bubbles into her ear when she was sleeping in the water after meals; but he never let any one touch Kolokolo Bird. At last things grew so exciting that his dear families went off one by one in a hurry to the banks of the great grey-green, greasy Limpopo River, all set about with fever-trees, to borrow new noses from the Crocodile. When they came back nobody spanked anybody any more; and ever since that day, O Best Beloved, all the Elephants you will ever see, besides all those that you won’t, have trunks precisely like the trunk of the ‘satiable Elephant’s Child. Now, there wasn’t any bridge, and there wasn’t any ferry-boat, and Kangaroo didn’t know how to get over; so he stood on his legs and hopped. First he hopped one yard; then he hopped three yards; then he hopped five yards; his legs growing stronger; his legs growing longer. He hadn’t any time for rest or refreshment, and he wanted them very much. Hadn’t been given a name. You’d be a Marvellous Kid! She said to him ever so many times, graciously waving her tail, ‘My son, when you find a Hedgehog you must drop him into the water and then he will uncoil, and when you catch a Tortoise you must scoop him out of his shell with your paw.’ And so that was all right, Best Beloved. ‘But you said you wanted to be scooped out of your shell with my paw,’ said Painted Jaguar. ‘If you’ll think again you’ll find that I didn’t say anything of the kind. I said that your mother said that you were to scoop me out of my shell,’ said Slow-and-Solid. ‘What will happen if I do?’ said the Jaguar most sniffily and most cautious. ‘I warn you that your Mummy won’t be pleased. Don’t tell her I didn’t tell you,’ said Slow-Solid. ‘If you say another word about what my mother said—’ the Jaguar answered, but he had not finished the sentence before Slow-and-Solid quietly dived into the turbid Amazon, swam under water for a long way, and came out on the bank where Stickly-Prickly was waiting for him. ‘I tried to scoop something that said it wanted to be scooped out of its shell with my paw, and my paw is full of per-ickles,’ said Painted Jaguar. ‘Excellent!’ said Slow-and-Solid; and he held up Stickly-Prickly’s chin, while Stickly-Prickly kicked in the waters of the turbid Amazon. Stickly-Prickly helped to unlace Tortoise’s back-plates, so that by twisting and straining Slow-and-Solid actually managed to curl up a tiddy wee bit. ‘Excellent!’ said Stickly-Prickly; ‘but I shouldn’t do any more just now. It’s making you black in the face. Kindly lead me into the water once again and I’ll practise that side-stroke which you say is so easy.’ And so Stickly-Prickly practised, and Slow-Solid swam alongside. Some day before I’m old! One day Tegumai Bopsulai went down through the beaver-swamp to the Wagai river to spear carp-fish for dinner, and Taffy went too. Tegumai’s spear was made of wood with shark’s teeth at the end, and before he had caught any fish at all he accidentally broke it clean across by jabbing it down too hard on the bottom of the river. They were miles and miles from home (of course they had their lunch with them in a little bag), and Tegumai had forgotten to bring any extra spears. Just then a Stranger-man came along the river, but he belonged to a far tribe, the Tewaras, and he did not understand one word of Tegumai’s language. He stood on the bank and smiled at Taffy, because he had a little girl-daughter of his own at home. Tegumai drew a hank of deer-sinews from his mendy-bag and began to mend his spear. ‘Come here,’ said Taffy. ‘Do you know where my Mummy lives?’ And the Stranger-man said ‘Um!’—being, as you know, a Tewara. ‘Silly!’ said Taffy, and she stamped her foot, because she saw a shoal of very big carp going up the river just when her Daddy couldn’t use his spear. ‘Don’t bother grown-ups,’ said Tegumai, so busy with his spear-mending that he did not turn round. ‘Then don’t bother me,’ said Tegumai, and he went on pulling and straining at the deer-sinews with his mouth full of loose ends. The Stranger-man—a genuine Tewara he was—sat down on the grass, and Taffy showed him what her Daddy was doing. The Stranger-man thought, ‘This is a very wonderful child. She stamps her foot at me and she makes faces. She must be the daughter of that noble Chief who is so great that he won’t take any notice of me.’ So he smiled more politely than ever. The Stranger-man (and he was a Tewara) thought, ‘This is a very, very wonderful child. She waves her arms and she shouts at me, but I don’t understand a word of what she says. But if I don’t do what she wants, I greatly fear that that haughty Chief, Man-who-turns-his-back-on-callers, will be angry.’ He got up and twisted a big flat piece of bark off a birch-tree and gave it to Taffy. He did this, Best Beloved, to show that his heart was as white as the birch-bark and that he meant no harm; but Taffy didn’t quite understand. The Stranger-man (and he was a Tewara) didn’t say anything, so Taffy put up her little hand and pulled at the beautiful bead and seed and shark-tooth necklace round his neck. The Stranger-man (and he was a Tewara) looked at the picture and nodded very hard. He said to himself, ‘If I do not fetch this great Chief’s tribe to help him, he will be slain by his enemies who are coming up on all sides with spears. Now I see why the great Chief pretended not to notice me! He feared that his enemies were hiding in the bushes and would see him deliver a message to me. Therefore he turned his back, and let the wise and wonderful child draw the terrible picture showing me his difficulties. I will away and get help for him from his tribe.’ He did not even ask Taffy the road, but raced off into the bushes like the wind, with the birch-bark in his hand, and Taffy sat down most pleased. ‘What have you been doing, Taffy?’ said Tegumai. He had mended his spear and was carefully waving it to and fro. ‘Very well,’ said Tegumai, and went on fishing. ‘Most shocking!’ said the Neolithic ladies, and they filled the Stranger-man’s hair with mud (at which he was surprised), and they beat upon the Reverberating Tribal Drums, and called together all the chiefs of the Tribe of Tegumai, with their Hetmans and Dolmans, all Neguses, Woons, and Akhoonds of the organisation, in addition to the Warlocks, Angekoks, Juju-men, Bonzes, and the rest, who decided that before they chopped the Stranger-man’s head off he should instantly lead them down to the river and show them where he had hidden poor Taffy. And so they were. First of all walked Teshumai Tewindrow and the Neolithic ladies, tightly holding on to the Stranger-man, whose hair was full of mud (although he was a Tewara). Behind them came the Head Chief, the Vice-Chief, the Deputy and Assistant Chiefs (all armed to the upper teeth), the Hetmans and Heads of Hundreds, Platoffs with their Platoons, and Dolmans with their Detachments; Woons, Neguses, and Akhoonds ranking in the rear (still armed to the teeth). Behind them was the Tribe in hierarchical order, from owners of four caves (one for each season), a private reindeer-run, and two salmon-leaps, to feudal and prognathous Villeins, semi-entitled to half a bearskin of winter nights, seven yards from the fire, and adscript serfs, holding the reversion of a scraped marrow-bone under heriot (Aren’t those beautiful words, Best Beloved?). They were all there, prancing and shouting, and they frightened every fish for twenty miles, and Tegumai thanked them in a fluid Neolithic oration. ‘Explain! Explain! Explain!’ cried all the Tribe of Tegumai. ‘Where are the bad people who speared you, my darling?’ said Teshumai Tewindrow. ‘Er—um—Pr’aps I’d better ‘splain that I gave him that picture,’ said Taffy, but she did not feel quite comfy. ‘Taffy dear, I’m afraid we’re in for a little trouble,’ said her Daddy, and put his arm round her, so she didn’t care. ‘Explain! Explain! Explain!’ said the Head Chief of the Tribe of Tegumai, and he hopped on one foot. Nobody said anything at all for a long time, till the Head Chief laughed; then the Stranger-man (who was at least a Tewara) laughed; then Tegumai laughed till he fell down flat on the bank; then all the Tribe laughed more and worse and louder. The only people who did not laugh were Teshumai Tewindrow and all the Neolithic ladies. They were very polite to all their husbands, and said ‘idiot!’ ever so often. ‘I didn’t intend to; I only wanted Daddy’s black-handled spear,’ said Taffy. ‘Never mind. It is a great invention, and some day men will call it writing. At present it is only pictures, and, as we have seen to-day, pictures are not always properly understood. But a time will come, O Babe of Tegumai, when we shall make letters—all twenty-six of ‘em,—and when we shall be able to read as well as to write, and then we shall always say exactly what we mean without any mistakes. Let the Neolithic ladies wash the mud out of the stranger’s hair. Then they adopted the Stranger-man (a genuine Tewara of Tewar) into the Tribe of Tegumai, because he was a gentleman and did not make a fuss about the mud that the Neolithic ladies had put into his hair. But from that day to this (and I suppose it is all Taffy’s fault), very few little girls have ever liked learning to read or write. Most of them prefer to draw pictures and play about with their Daddies—just like Taffy. ‘What for?’ said her Daddy. ‘Now, make another noise,’ said Taffy, very proud. ‘Yah!’ said her Daddy, very loud. ‘It’s very like the carp-fish-mouth noise. Let’s draw another bit of the carp-fish and join ‘em,’ said her Daddy. He was quite incited too. ‘No. If they’re joined, I’ll forget. Draw it separate. Draw his tail. If he’s standing on his head the tail will come first. ‘Sides, I think I can draw tails easiest,’ said Taffy. Her Daddy nodded, and his eyes were shiny bright with ‘citement. ‘Oh!’ said her Daddy, very loud. ‘Ssh!’ said her Daddy, and frowned to himself, but Taffy was too incited to notice. ‘That’s quite easy,’ she said, scratching on the bark. ‘Why?’ said Taffy, and her eyes shone too with incitement. ‘And still it would be just the same as if you stood there and said, “G’way, Taffy, or you’ll get fever.” All that in a carp-fish-tail and a round egg! O Daddy, we must tell Mummy, quick!’ and Taffy danced all round him. ‘P’raps that’s safest. It’s very like our drying-poles, anyhow,’ said her Daddy, laughing. ‘Now I’ll make a new noise with a snake and drying-pole sound in it. I’ll say shi. That’s Tegumai for spear, Taffy.’ And he laughed. ‘Oh, that’s lovely! Much better than a thin frog. Go on,’ said Taffy, using her shark’s tooth. ‘But I do—but I do!’ said Tegumai. ‘Just attend a minute, Taffy, and we won’t do any more to-day. We’ve got shu-ya all right, haven’t we? but this las is a teaser. La-la-la!’ and he waved his shark-tooth. ‘There’s the hissy-snake at the end and the carp-mouth before the snake—as-as-as. We only want la-la,’ said Taffy. ‘It sounds all rough and edgy, like your shark-tooth saw when you’re cutting out a plank for the canoe,’ said Taffy. ‘Shu-ya-las ya-maru,’ said Taffy, reading it out sound by sound. So her Mummy most carefully didn’t; and bright and early next morning Tegumai went down to the river to think about new sound-pictures, and when Taffy got up she saw Ya-las (water is ending or running out) chalked on the side of the big stone water-tank, outside the Cave. ‘Um,’ said Taffy. ‘These picture-sounds are rather a bother! Daddy’s just as good as come here himself and told me to get more water for Mummy to cook with.’ She went to the spring at the back of the house and filled the tank from a bark bucket, and then she ran down to the river and pulled her Daddy’s left ear—the one that belonged to her to pull when she was good. Many of the other pictures were much too beautiful to begin with, especially before lunch, but as they were drawn over and over again on birch-bark, they became plainer and easier, till at last even Tegumai said he could find no fault with them. They turned the hissy-snake the other way round for the Z-sound, to show it was hissing backwards in a soft and gentle way (23); and they just made a twiddle for E, because it came into the pictures so often (24); and they drew pictures of the sacred Beaver of the Tegumais for the B-sound (25, 26, 27, 28); and because it was a nasty, nosy noise, they just drew noses for the N-sound, till they were tired (29); and they drew a picture of the big lake-pike’s mouth for the greedy Ga-sound (30); and they drew the pike’s mouth again with a spear behind it for the scratchy, hurty Ka-sound (31); and they drew pictures of a little bit of the winding Wagai river for the nice windy-windy Wa-sound (32, 33); and so on and so forth and so following till they had done and drawn all the sound-pictures that they wanted, and there was the Alphabet, all complete. And after thousands and thousands and thousands of years, and after Hieroglyphics and Demotics, and Nilotics, and Cryptics, and Cufics, and Runics, and Dorics, and Ionics, and all sorts of other ricks and tricks (because the Woons, and the Neguses, and the Akhoonds, and the Repositories of Tradition would never leave a good thing alone when they saw it), the fine old easy, understandable Alphabet—A, B, C, D, E, and the rest of ‘em—got back into its proper shape again for all Best Beloveds to learn when they are old enough. A is scratched on a tooth—an elk-tusk I think. C is a pearly oyster-shell—inside front. D must be a sort of mussel-shell—outside front. F is broken, but what remains of it is a bit of stag’s horn. R is, of course, just a shark’s tooth. Y is the carp’s tail in ivory. Z is a bell-shaped piece of agate marked with Z-shaped stripes. They made the Z-snake out of one of the stripes by picking out the soft stone and rubbing in red sand and bee’s-wax. Just in the mouth of the bell you see the clay bead repeating the Z-letter. The next bead is a small round greeny lump of copper ore; the next is a lump of rough turquoise; the next is a rough gold nugget (what they call water-gold); the next is a melon-shaped clay bead (white with green spots). Then come four flat ivory pieces, with dots on them rather like dominoes; then come three stone beads, very badly worn; then two soft iron beads with rust-holes at the edges (they must have been magic, because they look very common); and last is a very very old African bead, like glass—blue, red, white, black, and yellow. Then comes the loop to slip over the big silver button at the other end, and that is all. BEFORE the High and Far-Off Times, O my Best Beloved, came the Time of the Very Beginnings; and that was in the days when the Eldest Magician was getting Things ready. First he got the Earth ready; then he got the Sea ready; and then he told all the Animals that they could come out and play. And the Animals said, ‘O Eldest Magician, what shall we play at?’ and he said, ‘I will show you.’ He took the Elephant—All-the-Elephant-there-was—and said, ‘Play at being an Elephant,’ and All-the-Elephant-there-was played. He took the Beaver—All-the-Beaver-there-was—and said, ‘Play at being a Beaver,’ and All-the-Beaver-there-was played. He took the Cow—All-the-Cow-there-was—and said, ‘Play at being a Cow,’ and All-the-Cow-there-was played. He took the Turtle—All-the-Turtle-there-was—and said, ‘Play at being a Turtle,’ and All-the-Turtle-there-was played. One by one he took all the beasts and birds and fishes and told them what to play at. ‘I am not afraid,’ said Pau Amma, and he rose to the top of the sea in the moonlight. There was nobody in the world so big as Pau Amma—for he was the King Crab of all Crabs. Not a common Crab, but a King Crab. One side of his great shell touched the beach at Sarawak; the other touched the beach at Pahang; and he was taller than the smoke of three volcanoes! As he rose up through the branches of the Wonderful Tree he tore off one of the great twin-fruits—the magic double-kernelled nuts that make people young,—and the little girl-daughter saw it bobbing alongside the canoe, and pulled it in and began to pick out the soft eyes of it with her little golden scissors. ‘Payah kun‘ (That is right). ‘Kun?‘ said the Fisherman of the Moon. And Pau Amma? You can see when you go to the beach, how all Pau Amma’s babies make little Pusat Taseks for themselves under every stone and bunch of weed on the sands; you can see them waving their little scissors; and in some parts of the world they truly live on the dry land and run up the palm trees and eat cocoa-nuts, exactly as the girl-daughter promised. But once a year all Pau Ammas must shake off their hard armour and be soft—to remind them of what the Eldest Magician could do. And so it isn’t fair to kill or hunt Pau Amma’s babies just because old Pau Amma was stupidly rude a very long time ago. Near the track of most B.I.’s. Or if you can’t wait till then, ask them to let you have the outside page of the Times; turn over to page 2, where it is marked ‘Shipping’ on the top left hand; then take the Atlas (and that is the finest picture-book in the world) and see how the names of the places that the steamers go to fit into the names of the places on the map. Any steamer-kiddy ought to be able to do that; but if you can’t read, ask some one to show it you. The very minute and second, Best Beloved, the dried horse-skin Curtain that was stretched tail-down at the mouth of the Cave fell down—woosh!—because it remembered the bargain she had made with the Cat, and when the Woman went to pick it up—lo and behold!—the Cat was sitting quite comfy inside the Cave. To ‘muse herself, not me. There are three hundred and fifty-five stories about Suleiman-bin-Daoud; but this is not one of them. It is not the story of the Lapwing who found the Water; or the Hoopoe who shaded Suleiman-bin-Daoud from the heat. It is not the story of the Glass Pavement, or the Ruby with the Crooked Hole, or the Gold Bars of Balkis. It is the story of the Butterfly that Stamped. Suleiman-bin-Daoud was strong. Upon the third finger of the right hand he wore a ring. When he turned it once, Afrits and Djinns came out of the earth to do whatever he told them. When he turned it twice, Fairies came down from the sky to do whatever he told them; and when he turned it three times, the very great angel Azrael of the Sword came dressed as a water-carrier, and told him the news of the three worlds,—Above—Below—and Here. And yet Suleiman-bin-Daoud was not proud. He very seldom showed off, and when he did he was sorry for it. Once he tried to feed all the animals in all the world in one day, but when the food was ready an Animal came out of the deep sea and ate it up in three mouthfuls. Suleiman-bin-Daoud was very surprised and said, ‘O Animal, who are you?’ And the Animal said, ‘O King, live for ever! I am the smallest of thirty thousand brothers, and our home is at the bottom of the sea. We heard that you were going to feed all the animals in all the world, and my brothers sent me to ask when dinner would be ready.’ Suleiman-bin-Daoud was more surprised than ever and said, ‘O Animal, you have eaten all the dinner that I made ready for all the animals in the world.’ And the Animal said, ‘O King, live for ever, but do you really call that a dinner? Where I come from we each eat twice as much as that between meals.’ Then Suleiman-bin-Daoud fell flat on his face and said, ‘O Animal! I gave that dinner to show what a great and rich king I was, and not because I really wanted to be kind to the animals. Now I am ashamed, and it serves me right.’ Suleiman-bin-Daoud was a really truly wise man, Best Beloved. After that he never forgot that it was silly to show off; and now the real story part of my story begins. He married ever so many wifes. He married nine hundred and ninety-nine wives, besides the Most Beautiful Balkis; and they all lived in a great golden palace in the middle of a lovely garden with fountains. He didn’t really want nine-hundred and ninety-nine wives, but in those days everybody married ever so many wives, and of course the King had to marry ever so many more just to show that he was the King. ‘Gracious!’ said his wife, and sat quite quiet; but Suleiman-bin-Daoud laughed till the tears ran down his face at the impudence of the bad little Butterfly. Balkis the Most Beautiful stood up behind the tree among the red lilies and smiled to herself, for she had heard all this talk. She thought, ‘If I am wise I can yet save my Lord from the persecutions of these quarrelsome Queens,’ and she held out her finger and whispered softly to the Butterfly’s Wife, ‘Little woman, come here.’ Up flew the Butterfly’s Wife, very frightened, and clung to Balkis’s white hand. Away flew the Butterfly’s Wife to her husband, and in five minutes they were quarrelling worse than ever. ‘No, little brother,’ said Suleiman-bin-Daoud, ‘she will never laugh at you again,’ and he turned the ring on his finger—just for the little Butterfly’s sake, not for the sake of showing off,—and, lo and behold, four huge Djinns came out of the earth! They came down the marble steps, one hundred abreast, and beneath his camphor-tree, still weak with laughing, they saw the Most Wise King Suleiman-bin-Daoud rocking back and forth with a Butterfly on either hand, and they heard him say, ‘O wife of my brother in the air, remember after this, to please your husband in all things, lest he be provoked to stamp his foot yet again; for he has said that he is used to this magic, and he is most eminently a great magician—one who steals away the very Palace of Suleiman-bin-Daoud himself. Go in peace, little folk!’ And he kissed them on the wings, and they flew away. And Suleiman-bin-Daoud, still looking after the Butterflies where they played in the sunlight, said, ‘O my Lady and Jewel of my Felicity, when did this happen? For I have been jesting with a Butterfly ever since I came into the garden.’ And he told Balkis what he had done. Balkis—The tender and Most Lovely Balkis—said, ‘O my Lord and Regent of my Existence, I hid behind the camphor-tree and saw it all. It was I who told the Butterfly’s Wife to ask the Butterfly to stamp, because I hoped that for the sake of the jest my Lord would make some great magic and that the Queens would see it and be frightened.’ And she told him what the Queens had said and seen and thought. But wasn’t it clever of Balkis?